A small site - only 1.25 acres, located adjacent to the Conservation Area in this South Cambridgeshire village. The site had originally been allocated, as part of a much larger site, in the Adopted Local Plan. However, as the site had not come forward for development and the County Council's previous proposals to relocate the school on the site were subsequently abandoned, the Local Authority decided to de-allocate the site in the Local Plan Review. 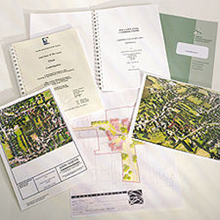 Terms were agreed with three landowners to promote their portion of the site which we considered could be developed as an Executive Detached Housing Scheme for 5 dwellings, accessed independently. A Planning Application, following refusal, was taken to Appeal, with ORS' case handled by Mr Harry Wolton QC. The Appeal was successful with the decision being published nine days later! After an amphibian survey and archaeological investigation had been commissioned by the Company, the site was sold by Limited Invitation Tender to Amber Homes (St Ives) Limited.